(Newser) – In an extensive new profile for Esquire, Bruce Springsteen opens up about the difficult relationship he had with his father growing up—one that made more sense when Springsteen found out, as an adult, that his father had been diagnosed as a paranoid schizophrenic. 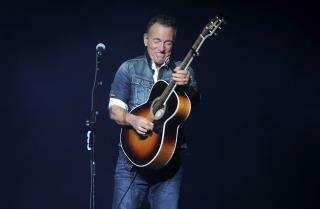 Springsteen has long struggled with his own mental health, having his first breakdown at age 32 and another in his 60s. He's been in analysis ever since that first breakdown, and says it saved his life. But, he says, he still fears a diagnosis similar to his father's. How can this possibly be considered as newsworthy??? There for the grace of God.!!! My, my how times have changed. I remember hearing “born in the USA” in mid 80’s. That song made u feel good, even if you weren’t a fan. But if it was released post-Trump president elect....... you’d be considered a “racist” for listening to it.